On Sunday 11th June 2017 the Club held its annual Trophy Day event at Fairlands Hall, to recognise the achievements of all our players this season. The turnout was typically good this year, and thanks to all of you who helped run the stalls and serve the hot dogs. We’ve since received many favourable comments about the day – the only ‘could do better’ was that the PA system needed a little oiling! 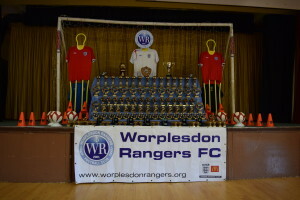 A big thank-you to all those who turned up in the morning to help set up the seating and the brilliant display of trophies (and thanks also to the small army involved in the rapid clear-up at the end of an exhausting afternoon!). Coach Tony Mainee and Assistant Coach Chris Teller kicked off the players’ awards by presenting each of our Reception Mini-Rangers with their Club trophy! Sadly, 2017 will be the last season that Tony Mainee will be the coach for the Mini Rangers. I am sure you will all join me in wishing Tony all the best for the future, and a massive thank you for all his time over the years. 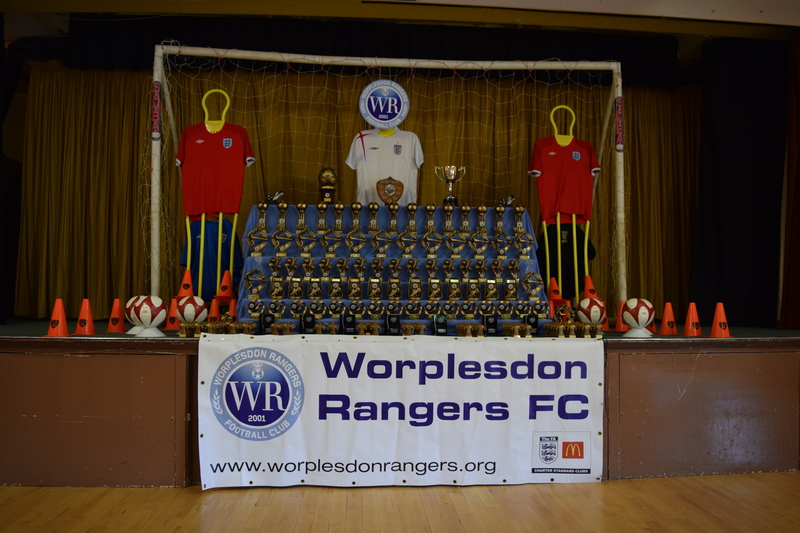 Next up, it was the turn of our older Mini-Rangers, with the awards being presented by the team rep, Oliver Arnell. The U7s this season had enough players to make up two teams. The awards were presented by coaching staff Angel Aburto, Olly Cummings and Martin Twist. Next in line were the U8 Pirates: Manager Dave Blake and Coach Scott Doherty presented the trophies. Next were the U8 Buccaneers: Manager Fraser Horne and Coach Steve Franklin presented the awards. Fraser and Steve felt that as this group was a late breakout team from Under 8s, they said all the players deserved the same recognition for their dedication and performance. Both Fraser and Steve manage another team, and so have had to put in a lot of extra commitment to be able to run a second team. U10 Scorpions: Manager Andi Scanlan and Coach Steve Franklin presided over the award of trophies…. Next up were Nick Reynolds and Fraser Horne to present the U11 Falcons’ awards..
Dave Wilson and Kevin Turnbull were on hand to continue the U11 honours, concentrating on the Eagles…. To complete the 2nd of the day’s sessions, the awards were presented by Manager Dan Wheatley. To kick off the last session of the day, who better to start the proceedings than the one and only Binny with the team coach Rob Horton…. The Trojans’ presentations got under way with Manager Andy Elton, who was joined at the front by Trojans Coach Paul Carter.. . The Lions team then took the stage hosted by Sean Crooke and team Coach Phill Gaff.. The Under 16s Surrey Youth League team had their Manager Paul Sarney and Coach Andy Barry to present their awards..
Shaun Dyer, Dean Brockbank and Dave Barrett got the next block of awards started, recognising the achievements of the U9 Panthers this season. Clare Jones Clare has been awarded a Committee Special Recognition Award for her commitment to the club for the past 3 years as Club Secretary, and in the 2016/2017 Season also taking on the roles of Treasurer, Interim Chairman and Membership Officer. Sadly Clare leaves the club this year, as she is exhausted. The following volunteers, Managers and coaches were all presented with an award celebrating their 5 years service at Worplesdon Rangers Football Club.